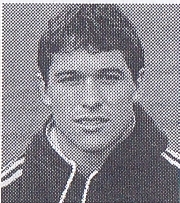 Although he had been one of Australia’s best centres for a number of years, comparatively little was known about Richard Tombs in England before he joined Gloucester as one of the first three high-profile signings which followed the takeover of the club by Tom Walkinshaw in April 1997. Tombs had first toured Europe with the Wallabies as a twenty year-old in 1988 and was a member of the 1991 World Cup squad, but, largely because of the quality and consistency of Tim Horan and Jason Little, he had been restricted to just five international appearances. Tombs, born in Te Kuiti, New Zealand, on 5th January 1968, toured Britain with the Australian Schools side in 1985-86, before establishing himself in the New South Wales Waratahs side and on the fringes of the Australian Test team. However, by 1997, his chances of establishing himself in international rugby had faded and he responded well to the challenge of helping Gloucester to re-establish themselves in the upper echelons of the English game. Tombs played throughout every Gloucester game in the Allied Dunbar Premiership in his first season and also helped the side to win the inaugural Cheltenham and Gloucester Cup. He remained a regular in his second season, missing just two matches, and, while he played less regularly in his final season with the club in 1999-2000, he became a more regular try scorer, with six in ten matches. Tombs’ main virtue was his consistency; his broad range of passing skills, defensive reliability and understated intelligence made the players around him look better, and, with Terry Fanolua, he formed the most reliable and popular centre partnership the club has had in the professional era. Richard Tombs saved my life in 1988, in Amsterdam. He found an ambulance and escorted me to a hospital when I was in and out of consciousness after an ice skating accident. Thank you Richard!